The Victorian Fisheries Authority recognises the significant social and economic benefits resulting from well managed recreational trout fisheries. It is committed to maintaining and, where possible, enhancing these fisheries across Victoria. In earlier times, inland fisheries management essentially meant stocking. Today, management incorporates several practices to provide an integrated approach to freshwater fisheries management. The Authority's current commitment to recreational trout fisheries is focussed on several areas including stocking, research, construction and maintenance of infrastructure assisting angler access, enforcement, education, communication and habitat restoration and protection. Almost half of all angling effort in Victoria occurs on freshwater lakes, rivers and streams with trout being one of the most harvested species in these waters. 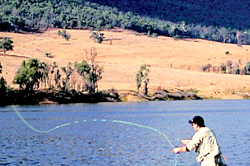 The Victorian trout fishery is a major social and economic contributor to regional communities with nearly half of all trout harvested in Australia being caught in Victoria. Inland anglers spend more $millions a year pursuing trout, redfin and native species such as Murray cod and golden perch. In addition to providing good sport fishing, many consider trout to be a choice table fish. Trout are a favoured angling species that have the ability to attain catchable sizes in relatively small lakes, rivers and streams, if habitat conditions are suitable. Trout prefer a cool, clean water environment and are susceptible to environmental impacts such as habitat reduction or removal, siltation and water pollution. These impacts, combined with the recent trend of higher temperatures and reduced rainfall, have severely affected some streams that previously supported good populations of trout and other fish species. 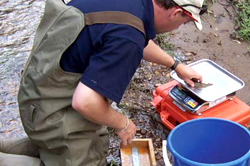 Fish population surveys, where abundance and species composition in a stream or lake is ascertained. Impacts of warming streams and climate changes. 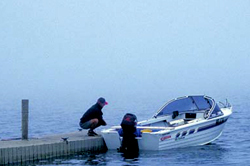 Fishing activities in all Victorian public waters are managed under the provisions of the Fisheries Act 1995 and the Fisheries Regulations 2009. 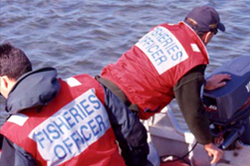 The main purpose of regulations is to protect fish stocks from excessive fishing pressure and to define and encourage responsible recreational fishing behaviour. 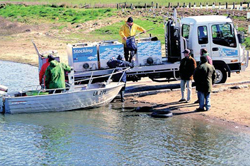 The two common types of controls used in the management of Victoria's trout fisheries are bag limits and closed seasons. 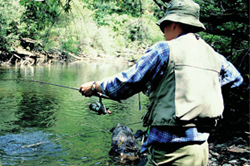 Bag limits define a reasonable take of trout from specified waters within a day's fishing. Bag limits also help to spread the catch of trout amongst anglers, particularly in stocking based fisheries. All Victorian waters, including lakes, rivers and streams, have bag limits for trout. Closed seasons are employed to provide some protection for spawning fish in self-sustaining trout populations. With the exception of selected sea-run trout fisheries, a closed season for trout fishing exists for all Victorian rivers and streams from midnight on the Monday of the Queens Birthday weekend in June, to midnight on the Friday before the first Saturday in September. Consultative meetings are held annually in five regional centres across the state to develop fish stocking plans and address other freshwater fisheries management issues. These meetings provide an opportunity for VFA to engage representatives from the Victorian Recreational (VRFish) and other stakeholders including Water Authorities and Catchment Management Authorities. The Victorian Fisheries Authority (VFA) releases between 300,000 and 400,000 salmonids (trout and salmon) each year. Trout are produced at the Snobs Creek hatchery and then transported in specialised trucks to agreed release locations. The majority of trout stockings by the Authority are undertaken using 'yearlings' which are on-grown trout. Sometimes, larger trout are stocked in selected small waters. When deciding which waters are appropriate for trout stocking a number of social, economic and ecological factors must be considered. Many impoundments that do not sustain an adequate natural population of trout are regularly stocked with both rainbow and brown trout. Depending on the level of success of trout releases, fisheries managers may decide to continue stocking, alter stocking levels or instigate research to identify any constraints on the fishery. In lakes and impoundments, stocking plans are often varied to take account of changing water levels that affect the carrying capacity. In severe drought the stocking of some waters may even cease. Such waters often become the focus of recovery plans once favourable conditions return. 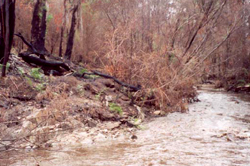 A small number of rivers and streams in Victoria are regularly stocked with trout, such as the Merri and Hopkins rivers in south-west Victoria. The return of good quality stocked fish from these waters is high, indicating the carrying capacity of these rivers is strong and that there is a low, or non-existent, self sustaining trout population. Most rivers that support a wild population of trout are not stocked. Natural resource managers appreciate that some wild trout populations are indeed too small to support a good fishery, however stocking is not always the answer. Research confirms the long held belief that the return of stocked trout is generally minimal when they are released into a river or stream containing a self-sustaining trout population. Low carrying capacity The primary reason wild trout abundance may not be high in a given stream is related to environmental conditions and the carrying capacity of that stream, which is determined by the quality of in-stream habitat and water flow. Natural variation in trout abundance often occurs between seasons as a consequence of climate induced fluctuations in stream flow and temperature. 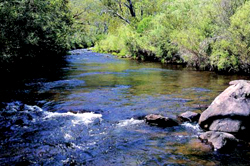 Trout in Victorian rivers are often subjected to less than ideal conditions during summer. High water temperatures impact trout populations by restricting their distribution, inhibiting their growth and even causing mortality in extreme cases. Higher stream flows help buffer against stream temperature changes, however, natural events such as drought have an uncontrollable negative effect on stream flow, habitat and in turn, trout quality and abundance. Unless completely wiped out by a catastrophic event, wild trout will recolonise naturally as the affected environment recovers. This has recently been demonstrated by research on bushfire affected streams. In extreme cases where habitat degradation is not identified as a limiting factor, stocking may be considered only as an aid to the initial recovery of a trout population that has been severely impacted as a consequence of a major, but temporary, change in habitat and environment. Where habitat degradation can be controlled, the restoration or enhancement of fish habitat is generally a more effective way of providing quality trout fisheries than fish stocking in rivers and streams. Habitat improvement, along with good water flow, will increase the carrying capacity of rivers and streams, which will result in the establishment of thriving trout populations. The Victorian Government will continue to work with recreational fishing stakeholders to ensure our trout fisheries provide outstanding fishing opportunities for the benefit of all Victorians. In support of this goal, the Authority will provide resources to maintain programs for research, stocking, enforcement, education and habitat restoration and protection. 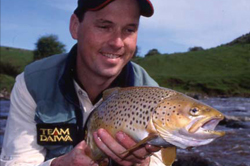 Brown trout were introduced to mainland Australia from Tasmania in 1864 as fertilised eggs. Fisheries Victoria stocks more brown trout than any other salmonid (trout and salmon). These stockings are predominantly into lakes and impoundments. This species of trout is widespread and abundant in north eastern Victoria where self-sustaining populations thrive in cool, fast flowing waters. Given good habitat and food, brown trout grow rapidly in their second and third year of life although few live beyond 5 to 6 years of age. Brown trout are considered to be a 'residential' fish exhibiting limited movement from established home ranges. Rainbow trout were introduced to Australia in 1894. They are widely stocked throughout Victoria, predominantly into lakes and impoundments, including small waters for second and third semester school holiday periods. They are most easily distinguished from brown trout by the abundance of spots on the tail fin. While shorter lived than brown trout, they grow faster in most circumstances. Chinook salmon are also known as Quinnat salmon and King salmon and are highly regarded by anglers as a strong sportsfish. They were first introduced to Australia in the 1870s. In natural circumstances, young and adults spend most of their life at sea, returning to their natal streams to spawn. Natural migratory stocks in North America have recorded fish of 1.6m and nearly 60kg. In Victoria they are only stocked into Lake Purrumbete and Bullen Merri although other lakes such as Lake Murdeduke and on occasion, Lake Modewarre could be stocked if water conditions are suitable. These waters have been known to produce fish of 89cm and 11.4kg (Lake Bullen Merri, 1981), but most fish are generally between 1 and 3kg. Atlantic salmon are often confused with brown trout and were first introduced to Australia in the 1860s. In natural circumstances, most of their life cycle is spent at sea, however the species has been stocked into lakes like Lake Purrumbete and Lake Bullen Merri in lieu of chinook but these stockings led to minimal success.